Fine Sometimes Rain – Kickstarter Special! The day is finally here! 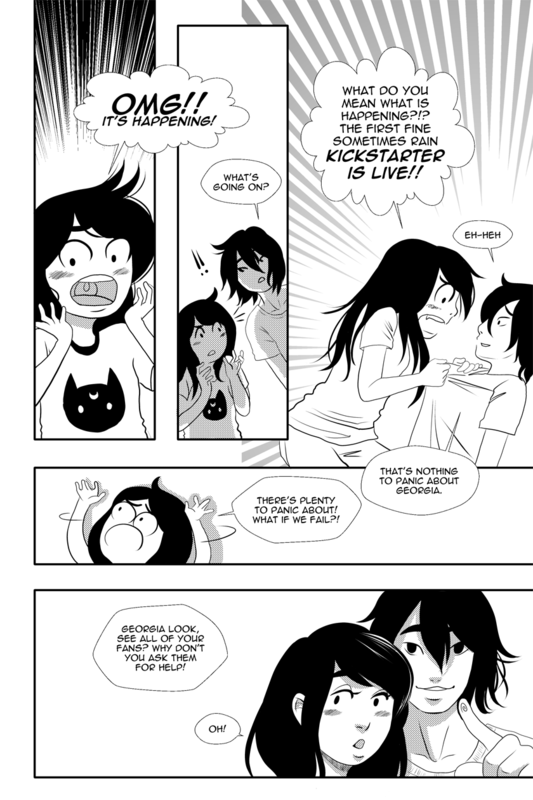 The very first Fine Sometimes Rain Kickstarter has gone live!! I hope you will all pledge for a copy of the book and help make this print funding a success!! Also if we are able to make the first stretch goal there are stickers in it for everyone who pledged on the physical copy tiers! I think the stickers are really cute so go check them out at the bottom of the KS page!! Also if you want to pledge please don’t wait for the last day (unless you are waiting for a payday) the more successfull of a showing we have in the first 24 hours the greater chance of being featured and also the greater chance of success overall. Thank you all!!! If you can’t pledge you can still show your support by retweeting my announcements and sharing my posts on Facebook! yup, and the comic has now become a sitcom. I kid! I kid! As Kickstarter just told me, I “successfully backed Fine Sometimes Rain Graphic Novel Vol. 1” YAY!!!!! I can’t wait to get the wallpaper that came with the package I got! Yay! thank you so much! We are soooo super close to being funded now!! It certainly is exciting! Also, love the Luna tshirt Georgia is wearing.